FREE Events coming up at Elland Library including a family fun morning for all to enjoy. This entry was posted in Elland, Feb, Get Involved / Have Your Say and tagged Children and Young People, Elland Library, Family Activities, Family Events, February, Get Involved, National Library Day. St Thomas’ Church, Greetland and West Vale, presents the Halifax Young Singers in Concert in church on Saturday 6 February at 7.30pm. Tickets available from St. Thomas’ church, or reserve tickets on St. Thomas’ website (www.stthomasgreetland.org.uk), or reserve on 01422 379994. This entry was posted in Feb, Get Involved / Have Your Say, Greetland & Stainland and tagged Halifax Young Singers, St Thomas' Church. This year marks the 400th anniversary of William Shakespeare’s death and to celebrate the legacy of this remarkable poet and playwright, Square Chapel has a few ‘wherefore art thou’s’ and ‘to be or not to be’s’ coming up on the following dates. Prices start from £21 per person, with dinner and weekend packages available too. To book call the box office on 01422 349422 or visit squarechapel.co.uk to start creating the perfect Valentine’s day for you and your beloved. This entry was posted in Feb, Get Involved / Have Your Say, Jan and tagged calderdale, Entertainment, Events, February, Halifax, January, Shakespeare, Square Chapel, Theatre. Would you like to help give away £70,000 to voluntary and community groups in Calderdale? Calderdale Council’s Small Grants scheme gives away small grants of up to £3,000 to voluntary and community groups all over Calderdale. This year we are giving away £70,000 to a range of community initiatives and voluntary sector projects. These grants are awarded through a Small Grants Panel, made up of Calderdale Councillors and representatives from voluntary groups, community groups and groups which represent communities of interest. These voluntary and community sector representatives are appointed for two years, and we are now inviting nominations for representatives to serve on the Community Grants Panel from April 2016 to March 2018. Each organisation can nominate one person as a representative. Deadline for nominations is Monday 22 February, following this if more than three nominations are received we will go to a ballot, with the successful new Panel members announced in April 2016. If you have any questions around the Small Grants Panel or Small Grants Scheme please contact Steve Martin on 01422 392317. This entry was posted in Brighouse, Elland, Feb, Get Involved / Have Your Say, Greetland & Stainland, Hipperholme & Lightcliffe, Jan, Rastrick and tagged Calderdale Council, Community Groups, Get Involved, Small Grants panel, Voluntary Groups. Do something this February half term with a variety of activities taking place at Kershaw’s Garden Centre – Drop in any time between 10am and 12pm on the following dates. There will be a £1 charge for materials and don’t miss the 3 for 2 offer on all toys in the toy shop. This entry was posted in Brighouse, Feb, Get Involved / Have Your Say and tagged Children's Activities, February, February Half Term, Get Involved, Kershaws Garden Centre, Young People. Registered charities in areas affected by Storm Eva now have until Friday 5 February 2016 to apply for match funding to be used towards flood relief efforts. Any registered charity currently running a fundraising appeal to help communities affected by the storm can apply to the match funding scheme administered by the DCLG. As part of its commitment to supporting those in England who have been worst affected by the two winter storms, the Government has agreed to provide £2 million in match funding to charities that have already begun fundraising activities to support flood victims. The money will go towards the recovery costs involved in restoring affected areas and communities as quickly as possible. Philanthropic organisations (eg rotary clubs). Gift Aid elements of donations are not eligible for match funding, and any funding paid is to be restricted and used by the charity in line with their appeal to help support the response to Storm Eva. To apply, please complete an expression of interest form and follow the instructions set out on page 5 of the Storm Eva flood relief appeals: government match-funding prospectus. Please note – The last date by which Expressions of Interest will be accepted is by midnight on Friday 5 February 2016 via email. This entry was posted in Brighouse, Elland, Feb, Get Involved / Have Your Say, Jan and tagged calderdale, Calderdale Flood Relief, Donations, environment, February, Flooding, Funding, Get Involved, January. Sarah Millican, Chris Ramsey, Justin Moorhouse, Rory Bremner, Jack Carroll and a mystery guest are set to bring you laugh out loud comedy and all for a great cause! All comedians are performing for free and Calderdale Council have kindly waived all costs meaning every single penny will be going to Community Foundation For Calderdale and Upper Calder Valley Renaissance to help people and local businesses who have been affected by the recent flooding. Tickets cost £20/£15 and can be booked online here. This entry was posted in Feb, Get Involved / Have Your Say and tagged Calderdale Council, Chris Ramsey, Comedy, Community Foundation for Calderdale, Jack Carroll, Justin Moorhouse, Rory Bremner, Sarah Millican, Upper Calder Valley Renaissance, Victoria Theatre. 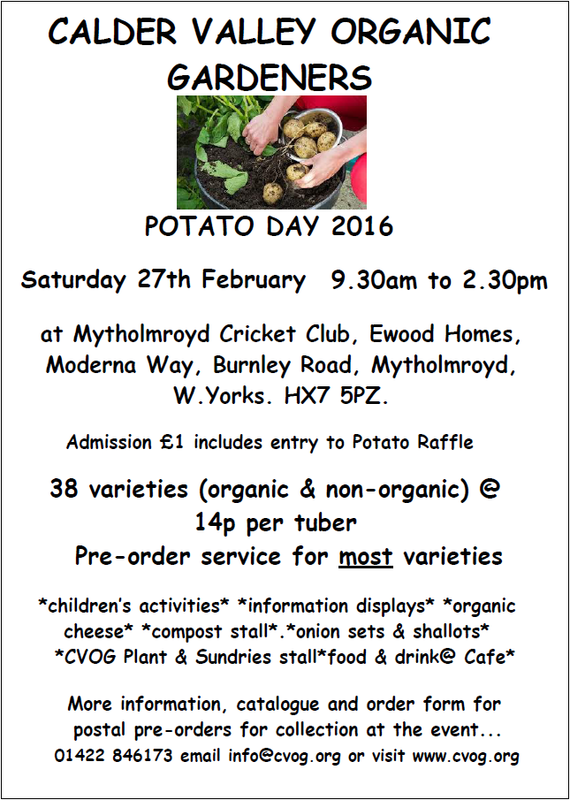 Get your organic goods at the Calder Valley Organic Gardeners Potato Day 2016; with children’s activities, information displays, stalls including cheese, compost CVOG plant and sundries, refreshments and more. At Mytholmroyd Cricket Club, Moderna Way, Burnley Rd, HX7 5PZ. This entry was posted in Feb, Get Involved / Have Your Say and tagged Calder Valley Organic Gardeners, Children's Activities, Event, February, food, Mytholmroyd, Potato Day, Stalls. The February to Easter 2016 edition of Calderdale ‘Do Something’ is now available and can be viewed here. Get out on your bike, Hunt for mini beasts, hunt for fossils or get down to the park for a bear hunt there’s lots to explore. This entry was posted in Apr, Feb, Get Involved / Have Your Say, Mar and tagged calderdale, Calderdale Council, Do Something, Events, February, Get Involved, March, Young People.